Read this book to see if love is possible the second time around. Maggie Stewart is a retired lawyer, working to preserve the heritage of her little English cottage in Summerfield village. Her children have grown and she's content to ride horses in the countryside and enjoy her retirement. Except she needs money for her renovations – and she's lonely. When she joins her old environmental team to go up against an oil company, Maggie finds herself working in opposition to a man she once loved from afar, many years ago. Idaho ranch owner Greg Warren is rich and entitled, with a dark past that he hides behind a professional smile. But inside, he struggles with loneliness after the loss of his wife, and the rage of a wild daughter who won't let him move on. Love blooms as Maggie and Greg take a chance on a new start, but can they find a balance between their two worlds? 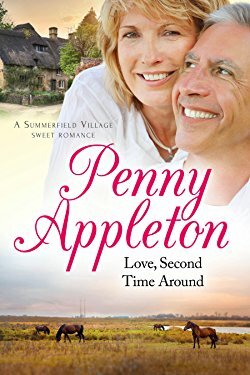 In this sweet romance, set between the English countryside and the mountains and farmland of Idaho, can Maggie and Greg find love second time around? Retired lawyer Maggie Stewart lives in charming 300-year-old Square Cottage in Summerfield, England - "it (the cottage) looks like a cottage teapot without a handle or a spout." Maggie is divorced with grown children. And more or less happy with her lot in life, albeit a bit lonely. Upon attending an environmental conference in Edinburgh Maggie reconnects with rich, handsome 60-ish Greg Warren from America, a heartthrob from the past. Mutual attraction rekindles, and the story begins. I enjoyed the London landmarks the author referenced - the Tate Museum, the Globe Theatre, the Thames, and St. Paul's Cathedral, among others that lent authenticity to the story. Both Maggie and Greg are sympathetic characters. When obstacles to the growing relationship arise, Maggie is pragmatic and upbeat, "...when the hope of another partner is gone, there's room for smaller delights: luxuriating in the bath, the song of the robin outside, visiting friends....I'm free to do whatever I want to do." Maggie is a strong, independent woman. I appreciate the historical references to the Nez Perce in Idaho (where Greg lives), the wolf program in Yellowstone Park and the Appaloosa horses that authenticate the American part of the story. I can wholeheartedly recommend this clean, romantic novel. or check out the author's pictures pictures on Facebook.com/PennyAppletonAuthor. Sounds like an enjoyable read about second chances. Thanks for sharing! This sounds like a nice second love romance. Thanks for sharing.